When members of the McKenzie Flyfishers met last fall in Eugene to bestow the first Glen Love Lifetime Contribution Award to Glen Love himself, many of those in attendance knew the recipient simply as that tall fellow in the plaid shirt and tortoise-shell glasses with the bemused expression and the wicked off-side cast, who could not tie a decent fly to save himself. But who could write one helluva letter to the editor. Well, that last part is certainly true. 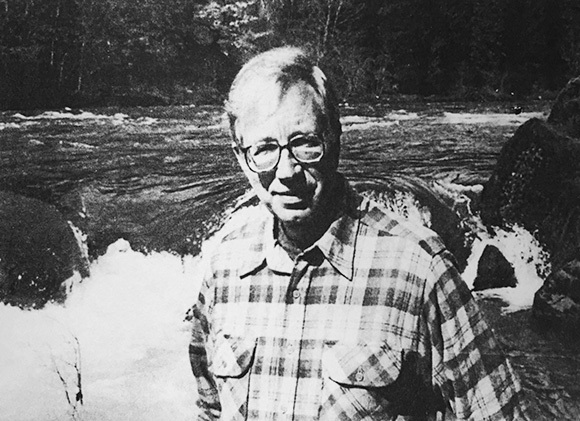 But it’s only part of the story of a man whose activism has had a lasting impact on Oregonians’ quality of life, and whose academic pursuits helped set a new course for the study of literature in virtually every university in the country and beyond. Love still remembers the first time he saw a fly-fisherman in action. It was in the 1940s at Green Lake in Seattle, where Love grew up. Spinning reels hadn’t yet been invented, so Love—a hook-and-worm angler, like everyone he knew—was stretching out his line and attaching a sinker to give him enough torque to pitch his bait far enough to give him a chance of catching something for dinner. Then, out of the fringe of trees above the lake, another fisherman emerged. Love watched as the man strode down to the lake’s edge, made a few artful casts with a long, quivering rod, and caught a fish. And then released it. Love had never seen anything like it: that effortless-looking cast, much less fishing, not for food, but for fishing’s own sake. Fly-fishing slowly became an organizing principle in his life. 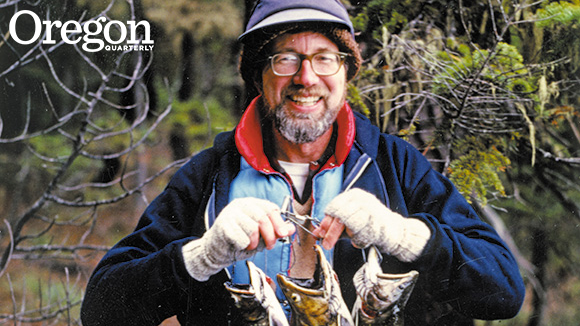 He fished in the Cascades when, at age 19, he spent a summer working at Mount Rainier National Park (where he met Rhoda, who would become not only his wife but a favorite biology teacher at Lane Community College and his partner in environmental activism). He fished around Seattle while pursuing his bachelor’s degree and, ultimately, his doctoral degree in literature at the University of Washington. He fished when and where he could around San Diego State University, site of his first university teaching job. That battle went on for several years, and those who opposed the plant were ultimately successful. But the Springfield Utility Board then proposed a new scheme for the North Fork: a series of five hydropower dams. It would have been the end of the wild fishery on the river. Love and Bumstead, who by then cochaired McKenzie Flyfishers’ conservation committee, led the club’s vocal opposition. They were supported by UO Book Store manager Jim Williams and composer Mason Williams, who arranged a concert—“Of Time and Rivers Flowing”—and took it on the road in support of a free-flowing North Fork. They and others managed to not only kill that proposal, but to ultimately help get key portions of the North Fork protected as part of the National Wild and Scenic River System, permanently putting it off limits to power interests. Months after receiving the eponymous fly-fishing award, Love is still a bit abashed and not certain that he’s entirely deserving. “You could have knocked me over with a feather when I got that award,” he insisted. Journalist Bonnie Henderson, BA ’79, MA ’85, was a student of Glen Love and is the author of four books, including The Next Tsunami: Living on a Restless Coast.